There is a plethora of Knickernappies Reviews and Giveaways around the web right now! Enter to win a Knickernappies OS Diaper from WeeLittleChanges! Their giveaway is open September 29-October 28, 2010! You don't want to miss out on an opportunity to win this great diaper from one of our favorite retailers! And don't forget, they offer FREE USA SHIPPING! The Inquisitive Mom is having a TWO Part Knickernappies Giveaway! In Part 1 she reviews the Knickernappies OS courtesy of The Nappy Shoppe! She purchased this great diaper with a Gift Certificate that she won at our Twitter Party! Woot! 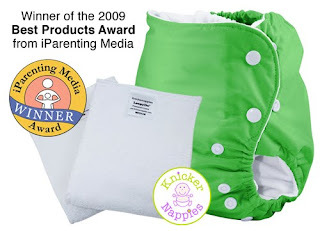 You can also enter to win a Knickernappies 2G Pocket Diaper with insert. Ends 10-25-10 In Part 2 The Inquisitive Mom is giving away a Knickernappies OS Diaper w/ Loopy Do's. *Have a Knickernappies Sighting you'd like to share? Post it to our FaceBook Wall and we'll check it out! Thank you for using the word plethora, that is all!